This article is about the novel. For the TV miniseries of the same name, see Frank Herbert's Children of Dune. Children of Dune is a 1976 science fiction novel by Frank Herbert, the third in his Dune series of six novels. Initially selling over 75,000 copies, it became the first hardcover best-seller ever in the science fiction field. The novel was critically well-received for its gripping plot, action, and atmosphere, and was nominated for the Hugo Award for Best Novel in 1977. It was originally serialized in Analog Science Fiction and Fact in 1976, and was the last Dune novel to be serialized before book publication. The novels Dune Messiah and Children of Dune were published in one volume by the Science Fiction Book Club in 2002 and the two were adapted into a well-received television miniseries entitled Frank Herbert's Children of Dune by the Sci-Fi Channel in 2003. At the end of Dune Messiah, Paul Atreides walks into the desert, a blind man, leaving his twin children Leto and Ghanima in the care of the Fremen, while his sister Alia rules the universe as regent. Awakened in the womb by the spice, the children are the heirs to Paul's prescient vision of the fate of the universe, a role that Alia desperately craves. House Corrino schemes to return to the throne, while the Bene Gesserit make common cause with the Tleilaxu and Spacing Guild to gain control of the spice and the children of Paul Atreides. Dune traces the rise of Paul Muad’Dib, a young nobleman in an interstellar feudal empire who takes control of the single critical resource in the universe — the lifespan-enhancing, consciousness-expanding drug spice melange. As the first book closes, Paul has triumphed. His scheming, evil enemies are dead or overthrown, and he is set to take the reins of power and bring a hard but enlightened peace to the universe. Herbert chose in the books that followed to undermine Paul's triumph with a string of failures and philosophical paradoxes; Dune was a heroic melody, and Dune Messiah was its inversion. When the second novel, Dune Messiah, opens, Muad’Dib’s religion has sent his fanatical soldiers on an interstellar jihad, destroying the traditional structures of government and leaving billions dead. His vision of peace is corrupted by dogmatic religious bureaucrats, and his once-noble desert tribes, the Fremen, grow fat and wealthy on the spoils of war and the de-desertification of Dune. Paul's young twin children, Leto II and Ghanima, have concluded that their guardian Alia has succumbed to abomination—the possession by one of her ancestors—and fear that a similar fate awaits them. They (and Alia) also realize that the terraforming of Dune will kill all the sandworms, thus destroying the source of the spice, but the thing which has possessed Alia desires this outcome. Leto also fears that, like his father, he will be trapped by his prescience. A band of Fremen outlaws capture Leto and force him to undergo the spice trance at the suggestion of Gurney Halleck, who has infiltrated the group on Jessica's orders. His spice-induced visions show him a myriad of possible futures where humanity has become extinct and only one where humanity survives. He names this future "The Golden Path" and resolves to bring it to fruition—something that his father, who had already glimpsed this future, refused to do. He escapes his captors and sacrifices his humanity in pursuit of the Golden Path by physically fusing with a school of sandtrout, gaining superhuman strength and near-invulnerability. He travels across the desert and confronts the Preacher who does, in fact, prove to be Paul. Leto declares himself Emperor and asserts control over the Fremen. Farad'n enlists in his service and delivers control of the Corrino armies. The seemingly immortal and omnipotent Leto is left as Emperor of the Known Universe, with Ghanima at his side. Leto symbolically marries her, but allows her to take Farad'n (renamed Harq al-Ada, "Breaking of Habit", and appointed Royal Scribe) as her consort so the Atreides line can continue. Initially selling over 75,000 copies, Children of Dune became the first hardcover best-seller ever in the science fiction field. The novel was critically well-received for its gripping plot, action, and atmosphere, and was nominated for the Hugo Award for Best Novel in 1977. In a 1976 review, Spider Robinson found Children of Dune unsatisfying, faulting the ending as unconvincing and thematically overfamiliar. The novel is referenced in A Thousand Plateaus (1980) by Gilles Deleuze and Félix Guattari. Reviewing Children of Dune, David Pringle gave the novel a rating of two stars out of four and described the novel as "dark and convoluted stuff." ^ a b Touponce, William F. (1988). "Herbert's Reputation". Frank Herbert. Boston, Massachusetts: Twayne Publishers imprint, G. K. Hall & Co. p. 119. ISBN 0-8057-7514-5. 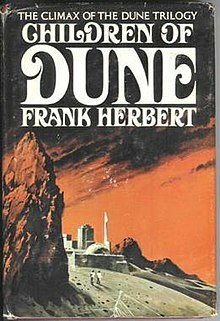 When Herbert completed the third book of the series, Children of Dune (1976), it became an authentic hardcover best-seller with seventy-five thousand copies sold (not including book club sales). It was the first hardcover best-seller ever in the science fiction field. ^ a b Jonas, Gerald (August 1, 1976). "Of Things To Come". The New York Times. p. 176. To appreciate Frank Herbert's achievement in the Dune trilogy, which concludes with Children of Dune you have to be a devotee of obsession ... Herbert's vision of a people forced by circumstance into total ecological awareness is worked out in convincing details ... What sets these books apart from their competitors is the obsessive quality of Herbert's imagination ... To read the Dune trilogy is to plunge into someone else's obsession ... Virtually every page in the trilogy contains a sentence that hints at the momentousness of the events being described. This is where the religiosity comes in. Herbert keeps interrupting the action with quotes from made-up sources that reinforce the atmosphere of millennial conflict and resolution. Taken out of context, these passages sound silly, like the words of wisdom spoken by Oriental sages on a TV sound stage ... But the whole point of an obsession is that it cannot be criticized from the outside; what distinguishes a successful obsessional tale from a failure that the reader is held, like Coleridge's Wedding Guest, so that 'he cannot choose but hear', no matter what his other faculties tell him. On this criterion, I would personally rate the Dune trilogy an unqualified success. ^ a b "1977 Hugo Awards". World Science Fiction Society. Archived from the original on May 7, 2011. Retrieved March 8, 2011. ^ Herbert, Frank (July 1980). "DuneGenesis". Omni. FrankHerbert.org. Archived from the original on January 7, 2012. Retrieved February 14, 2014. Of course there are other themes and fugal interplays in Dune and throughout the trilogy. Dune Messiah performs a classic inversion of the theme. Children of Dune expands the number of themes interplaying. I refuse, however, to provide further answers to this complex mixture. That fits the pattern of the fugue. You find your own solutions. Don't look to me as your leader. ^ Robinson, Spider (September 1976). "Galaxy Bookshelf". Galaxy Science Fiction. pp. 111–13. ^ Deleuze, Gilles; Guattari, Félix (1993). A Thousand Plateaus. Minneapolis: University of Minnesota Press. pp. 390, 559. ISBN 0-8166-1402-4. ^ Pringle, David (1990). The Ultimate Guide To Science Fiction. New York: Pharos Books: St. Martin's Press. p. 58. ISBN 0886875374.